CCM Tacks 3052 Jr Hockey Skate | Sports Etc. ATTACK FRAME Nylon ATTACKFRAME™. Greater structural support than standard construction. CORE Formula T3. Good support, stiffness and comfort for the occasional user. LINER Microfiber. For fit and comfort. TONGUE 7mm high density felt. With foam insert. Enhances the fit and comfort. OUTSOLE Low profile injected. Maximizes energy transfer. MIDSOLE Die cut plastic. Supportive feel. FOOTBED Anatomical response. Comfortable and durable. The CCM Tacks 3052 is a mid-level skate for the player that wants a great fit right out of the box. It is a full cut skate, with a more contoured ankle than its RBZ counterpart. Microfiber liner enhances comfort and moisture management, while the nylon frame increases the support and durability of the skate. 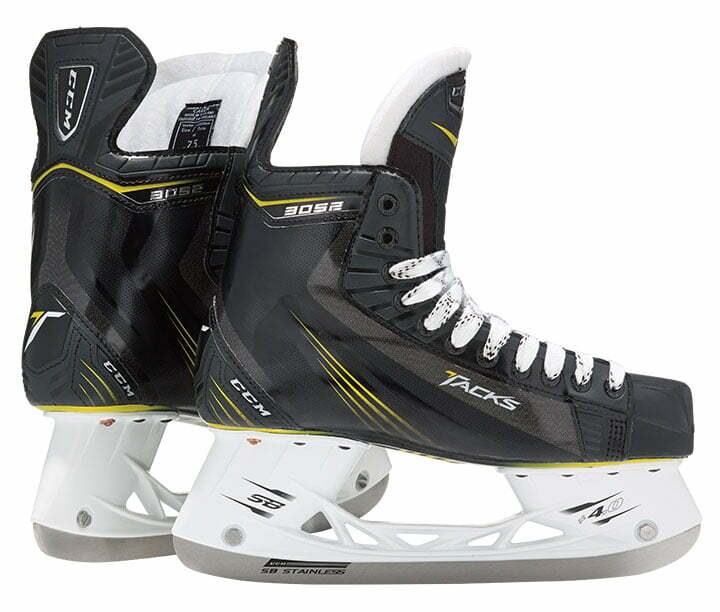 CCM Tacks Fit- Cut wide in the toe and more contoured around the heel. Tacks are perfect for someone with a fuller cut foot, who is still looking for a more contoured shape around the foot. Sports Etc Performance To Value Rating- 7 out of 10- A good value for any low to mid-level skater. Generously cut for added comfort.